Dawdle came to the funeral homes after being hand selected by Kevin Knartzer, owner and trainer of Tails Up Paws Down. The breeder is very particular about which dogs are bred and which ones are not. Dawdle’s breeder must be doing something right as one of their dogs was invited to Westminster, the largest dog show in the United States! 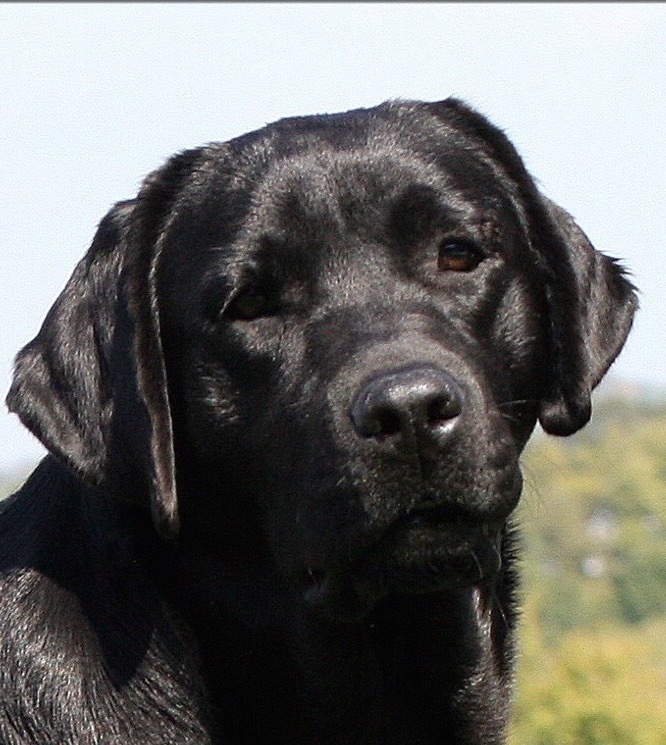 These Labradors are often referred to as English Labs and can appear much different to the average person as they are much stockier and a bit shorter then Labradors not bred to the breed standard. 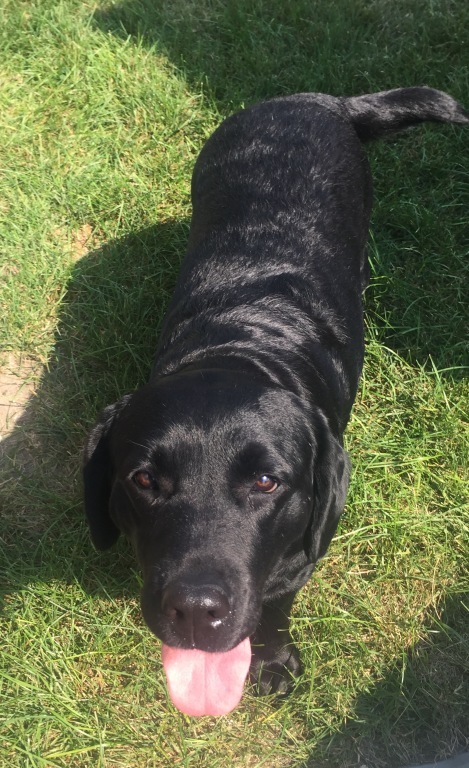 Many Labs in the Midwest are bred to be used for hunting and have very high energy levels while often being longer and taller then the standard calls for. Dawdle was raised on a farm with lots of other Labradors, horses and other farm animals. A few years ago the breeder had a very tragic incident where her barn/kennel caught fire and they lost many of their prized dogs. The reason that Dawdle is still with us is she was a very young puppy at the time and fortunately was in the house. The breeder, as you can imagine, was devastated by the loss of so many four legged souls and kept Dawdle for some time before discussing it with friend and came to the decision that Dawdle had too sweet of a personality to live a comfortable life as a pet. That is when she contacted us at Tails Up Paws Down! 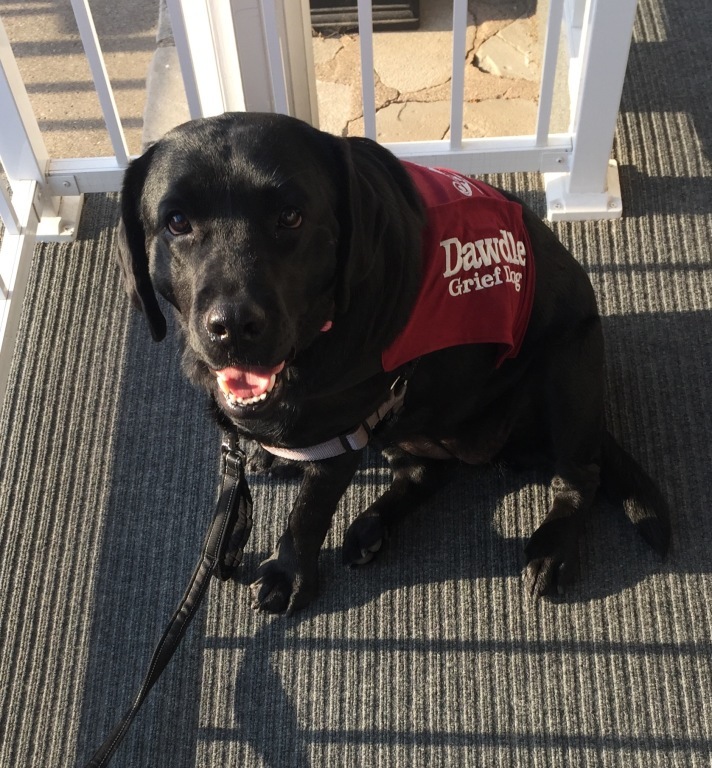 She was close to two years-old and Knartzer immediately knew she had potential to safely lift peoples spirits and provide comfort in their time of need! He has been placing and working with what is often referred to as Facility Dogs for over 15 years. He immediately knew Dawdle had great, great potential for this line of work! Knartzer only places dogs he feels will be not only 100% safe but that they will also be 100% happy to do the job asked of them. In fact he interviewed 3-4 dogs before deciding Dawdle’s calling was to be a comfort dog for the Walton’s funeral homes. He kept and trained Dawdle for an extended period of time exposing her to crowds, other dogs and even public venues to be sure she is confident and happy in very demanding situations. We only want to place the best of the best and the other dogs go on to live great life’s in carefully selected and screened pet homes. One misconception people have about dogs that work as facility dogs (and even service animals) is that the dog lives where they work. While some places do this we think that is very, very unfair to the dog. Every dog needs time to be a dog and that is why Dawdle lives with the Walton family! When she is off duty she likes to run and play, rest at her peoples feet and even sleeps in their youngest daughter’s bed so that she can get a good nights sleep after a long day of work. Dawdle may be an employee of the funeral home, but she is first and foremost a member of the Walton’s family! She is available upon request to meet with families during funeral arrangements, work during visitations and funeral services. 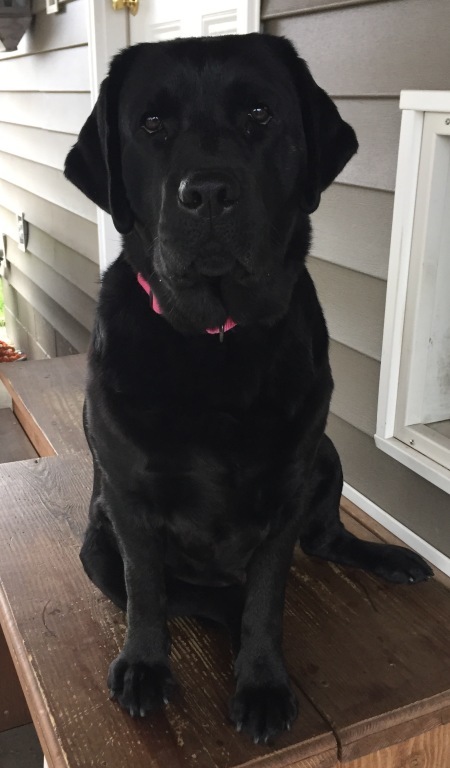 She loves to sit on the porch to greet those who come to visit. She looks forward to visiting the local nursing homes and schools. Call today if you would like to have Dawdle come visit!